The Jänissaari holiday home comprises a main cottage, beach sauna and barbecue hut, two private jetties and beach, and a small private island. They are situated on a peninsula by Lake Puula, known for its clear water and strong population of pike, pikeperch (zander), bream, trout and perch. These excellent fishing possibilities start from the jetties and shore of Jänissaari. Jänissaari holiday home is ideal if you want to spend a holiday on your own peninsula with its own private small island but still want to reach your cottage conveniently by car through a causeway. This way is a safe but still adventurous nature place. To understand the uniqueness of the location, please have a look at the map of Lake Puula. 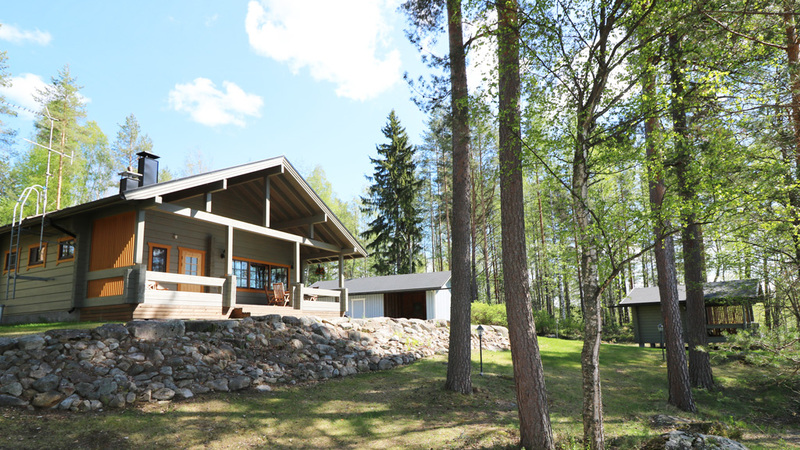 Cottage Jänissaari is ideal for families and groups of friends. The main cottage has two bedrooms with 2 beds in each and a spacy loft upstairs with three beds and one mattress. The kitchen is combined with a dining/living room, which enables spending time together even while cooking. The main cottage also features a well-equipped bathroom, toilet and electric sauna. There is as well a traditional wood sauna in a separate sauna building on the beach. Prices from: 955 euros/week and 676 euros/4 days. Final cleaning and free WiFi are included in the prices. Sheets & towel set 18 euros per person. Between 11 June and 2 September 2018, the minimum rental period is 7 days and the arrival day can be any weekday. For offer of longer periods (over a week), please write to sales@rockandlake.com Otherwise the minimum stay is 4 days. For additional information, please see the FAQ.